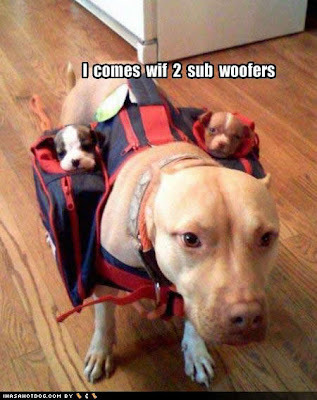 We all love free music. Well here you go. Exploding In Sound has served us music from a variety of artists on a platter. The compilation acts as a cohesive unit, so go ahead and sit back, fire up the BBQ or drive and press play. Ah yes, and I was responsible for getting the “ok” for Les Savy Fav to be on the mix. [Explodinginsound.com]Since the first compilation was released in early 2009, Exploding In Sound has delivered over two hundred bands both beloved and previously unknown. The audience has grown with each additional offering and things are only getting bigger and better. With that in mind we present you with our latest, the triumphant tenth edition to the series, the undisputed champ of promotional compilations… HOLY MOLY!! A collection of epic proportion, Exploding In Sound is beyond thrilled to celebrate this milestone with a line-up that we really couldn’t be more excited about. 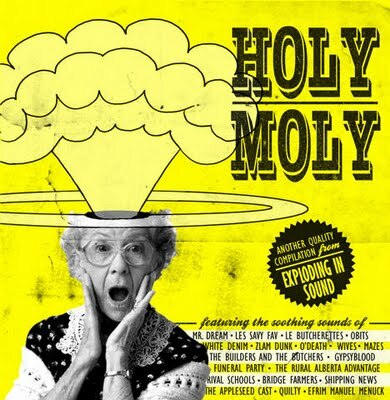 Let HOLY MOLY be the soundtrack to your summer, as you enjoy tracks from the phenomenal Les Savy Fav, Rival Schools, The Rural Alberta Advantage, The Appleseed Cast, Funeral Party, Le Butcherettes, Gypsyblood, Obits, The Builders and The Butchers, O’Death, Mr. Dream, Efrim Manuel Menuck (GYBE/Silver Mt. Zion) and much more. Here at EIS, we often wonder how are we going to top the previous compilation… well, HOLY MOLY I think we’ve done it again. 2. Crank up the speakers. 3. Enjoy in disbelief, while knowing it’s really happening. 4. Tell all your friends (and enemies if they have good taste in music). 5. Repeat steps 2 – 4 as needed (EIS recommendation: often). DOWNLOAD THE ENTIRE COMPILATION FOR FREE via Soundcloud.com or Exploding In Sound’s official BandCamp Page. As always the compilation is for 100% promotional use only so get your FREE digital download now!! The download comes with terrific artwork from our friends at High Five Industries, links for further enjoyment of all the bands, and more. Thanks to everyone who has helped put this collection together, especially the bands, their labels, and management. Without the help, interest, and cooperation of these people none of this would be possible, because after all this is about their music and artistic vision. I’d also like to thank the loyal Exploding In Sound fans for your continued support and belief in our cause! The compilation series has been a lot of fun and continues to reach new ears around the world, we can only hope you will continue to embrace our ever expanding catalog. EIS can only grow with your help and support, so spread the word. Rock music is very much alive and well, let’s make sure that everyone is aware. Sharing of the download link is HIGHLY recommended and encouraged to anyone and everyone you think might be interested. As this is a FREE compilation, the goal is to gain the maximum audience achievable, and word of mouth is always appreciated. PLEASE DOWNLOAD, SHARE, POST, and spread the word to everyone you know. ENJOY!